When is the last time you sat and thought about your home’s efficiency or comfort? If you answered never, don’t worry you’re not alone. Efficiency can be something we just don’t think about or we put to the back of the project list. It can also be a bit overwhelming for some. That is where we are here to help. Over the course of the next few blog posts we will be going through the home room-by-room to see if there are things that could be done to improve the comfort and/or efficiency. Let’s start in the bathroom. Lighting: what type of bulbs do you have installed? Switching to ENERGY STAR certified LEDs could save up to 90% in energy costs. When choosing a LED make sure to choose one that fits your lighting needs. For instance you might want to choose one that is closer to natural light rather than a warm light, especially if you will be doing things like applying make-up. Toilet: Yes we are going to talk about a toilet. A feature that is gaining popularity is a dual flush. These toilets can do a half flush and a full flush. We won’t go into the details of when to use which one but it is fairly self-explanatory. Regardless, using this feature can save up to 4,000 gallons of water a year per toilet. If a new toilet is not an option, there are many water saving devises that you can add to an existing one. These devices generally displace water so not as much is wasted each time you flush. Shower: Here is a little bit of a tougher one. Low flow showerheads are a great way to save water. The issue is not everyone appreciates them. Spa like showers with multiple showerheads don’t necessarily align with low flow and saving water. This falls into the category of weighing the savings and comfort. Windows: Yes the windows. 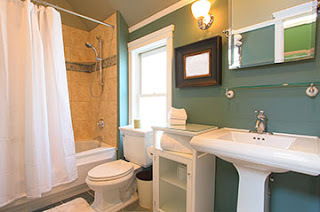 Do you have a window or two in the bathroom that is a major source of drafts. You might want to consider replacing it with an ENERGY STAR certified one. ENERGY STAR certified windows are better insulated and reduce condensation, a major source of mold, as well as reduce heat loss making the bathroom feel warmer. The draft coming from the window can have residual effects. First is the obvious draft that impacts your comfort as you come out of the shower. Now if you are raising the temperature in the home because of the drafts, you are now using more energy. If replacing the window is not an option, adding a supplemental heat source might be a solution. While this will add to the energy usage, it is generally less than raising the temperature of the entire home for just one room. Ventilation: The best ventilation will remove moisture and odor in the most efficient way possible. This is an area of function and efficiency needing to co-exist to provide a healthy living area. Utilizing an ENERGY STAR certified exhaust fan is a great start. These will use considerably less energy than a standard unit. From there, using fans that have automated features like a humidity and/or motion sensor are a great way to ensure the proper amount of ventilation is happening. While some might say not to use a fan because it is taking conditioned air out of the home, that would be a major mistake as the consequences such as mold, mildew and more are not worth it. Don’t miss our next post when we will take a look at the kitchen.